RARE & DISCONTINUED FLAT DARK EARTH COLOR! Magpul does not make or sell 10/30rd magazines, these are modified by Calegalmags! We have been the leader in modified CA compliant magazines since 2007, and this is our #1 selling item. Our modification is the best available! 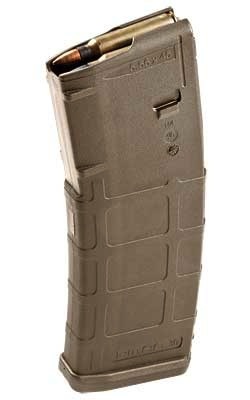 Calegalmags modifies Magpul Pmag magazines to 10rd capacity internally. We manufacture our own proprietary limiters which we insert into the magazine to limit capacity to 10 rounds maximum. The limiters are chemical and heat resistant and will never break or fail. In addition to the limiter we also seal the bottom of the magazine closed "permanently" with a industrial grade polymer adhesive (no rivets or blind pins). This magazine can not be taken apart without destroying it! The magazine spring inside maintains full length of travel in the magazine body and is not restricted in any way with our modification. Pmag Ranger Plate can not be added or upgraded by the end user after this modification is performed. So if you would like one installed please choose from the upgrade menu above and we will permanently install it instead of the standard floor plate for you during the modification process. Bought a total of 4 for my modern sporting rifle and they work great. Haven’t had any miss feeds and they’ve hit the ground many times and haven’t even gotten scratched!